In any event does anyone else grow still this plant because if so it may be worth giving it a name." Chris Larson 28/11/12. "I actually received this one from Neville as T. argentina hybrid - back in the 90's I think. Neville said it was grown from USA seed bank seed as T. argentina. My tag used to read "T. argentina hybrid NR Ex-BSI Seed Bank" & probably still does if I could locate it. It was me who amended it to T. argentina X didisticha? I have one about to flower in my back yard at the moment - I saw it the other day. Can't find it now. Recently the small clumps have been flowering with a branched inflorescence. Mine has a distinct T. argentina green about the leaves - not like Derek's which have gone more silver in his climate. I agree with Derek - that it does need a name. Any ideas on a name Neville? It pups quite well so there must be a bit of it around. I like it & most who come here ask for a piece." Len Colgan 29/11/12. "The conversation regarding this plant which is reportedly T. argentina x didisticha has been interesting, but I think I must now throw in my threepence worth. 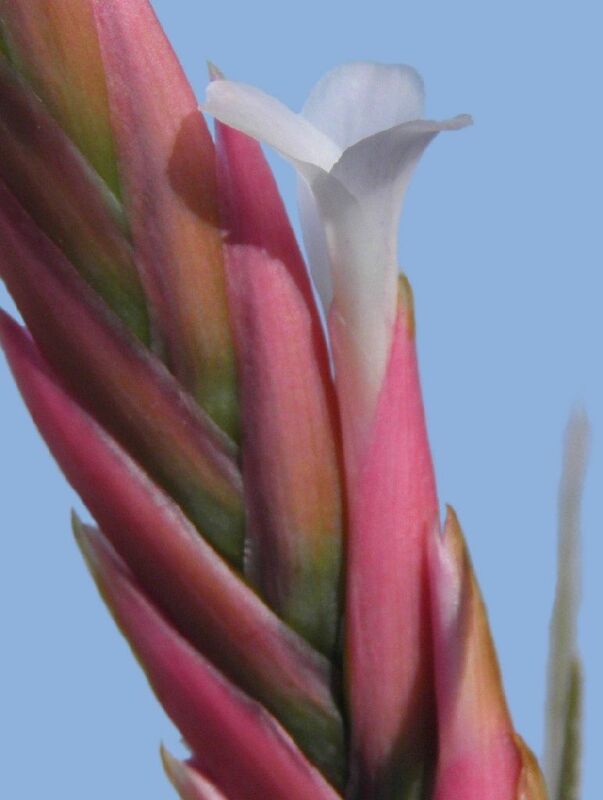 My first reaction was that the hybrid displayed too much of T. didisticha in the foliage and white flowers, although the shape of the spike is decidedly like T. argentina and not T. didisticha. Nevertheless, a very interesting hybrid worthy of a name. But this all leads to the "species" named T. genseri by Rauh. Please check Derek's disc for pictures of my plant in flower some years ago. It comes from the type species collection at Heidelberg. 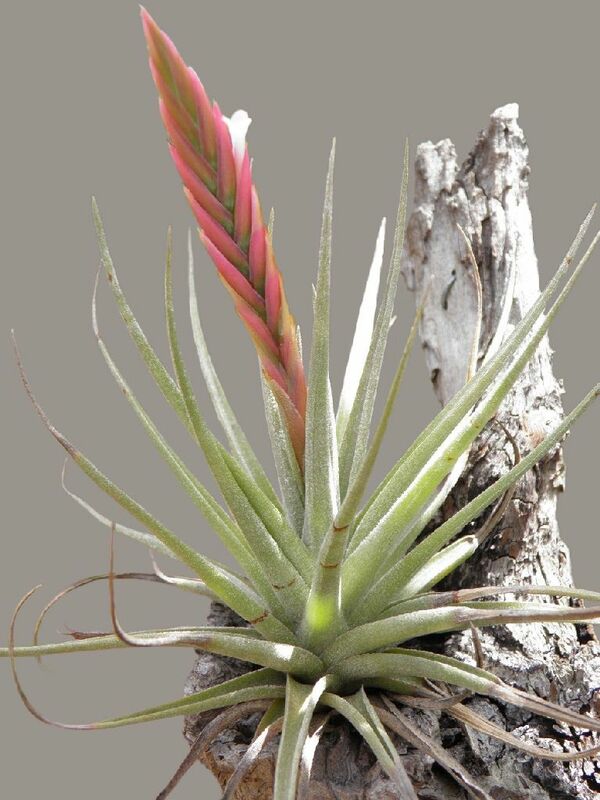 In the description, the differential diagnosis is against T. argentina, and the collected type plant was growing with T. didisticha. Hello!!! The second image on Derek's disc shows that the petals were pale pinkish with a while stripe down the middle. Hello!!! And the plant itself looks precisely what a natural hybrid of these two species might produce. Remember that Rauh was very old at the time. Even so, who can tell which of the two might be the pollen parent? The nice hybrid plant that Derek has flowered and originated in Queensland could easily be the reverse." George Nieuwenhoven 29/11/12. "I too obtained a plant of Chris some time ago, mine flowered last year and if I am not mistaken posted a picture of it then, it has produced 3 offsets so I would imagine by the rate of multiplication it is in many collections by now, it certainly is worthy of a name but in view of the comment by Len it's true identity should perhaps be worked out first."